This registered cover was sent from Nauru. Nauru is a tiny island in the west central Pacific at 0°32'S 166°55'E. Australian forces in September, 1914, just after the outbreak of World War I.
Australian stamps overprinted N. W. PACIFIC ISLANDS. were used until Nauru stamps were printed in 1924. 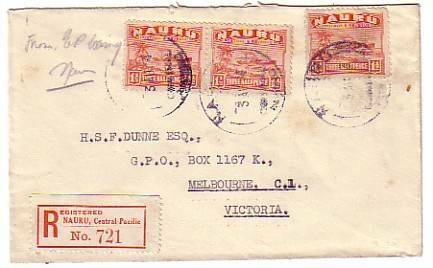 The three stamps on this cover are from this first Nauru issue. paper (Type I) portraying the freighter Century (SG 28). There are three barely legible NAURU CDS. Registry was provided by a preprinted label. The destination was Melbourne, Victoria. There are no transit marks on the front.